To the best of our knowledge, six studies have investigated the association between SOC, job stress, and mental health. ,,,,, Findings from these studies suggest that SOC modified the effect of job stress on mental health. To the best of our knowledge, only four studies have investigated the relationship between the SOC and depressive symptoms, one used the brief job stress questionnaire  and the other three used General Health Questionnaire. ,, These studies suggested that a weak SOC was a strong predictor of mental distress, including depressive symptoms. Nurses are exposed to high-stress work environments, including irregular work schedules, shift work, and interaction with patients and other hospital staff members. Therefore, preventing mental distress, including depressive state, is an important issue for nurses. The aim of this study was to investigate the relationship between depressive state, job stress, and SOC among nurses in Japanese general hospital. In February 2013, supervisors distributed a questionnaire to all nurses (n = 710) in a general hospital with 611 beds in an urban area in Japan. Nurse specialties included intensive care, pediatrics, surgery, oncology, and emergency medicine. Management allowed nurses to complete the questionnaires during their shifts. An explanation of the nature of the survey accompanied the questionnaire, which was anonymous and voluntary. Consent was assumed if participants answered and returned the questionnaire. The study was approved by both the local direction board and the committee for the prevention of physical disease and mental illness among health care workers at the general hospital. 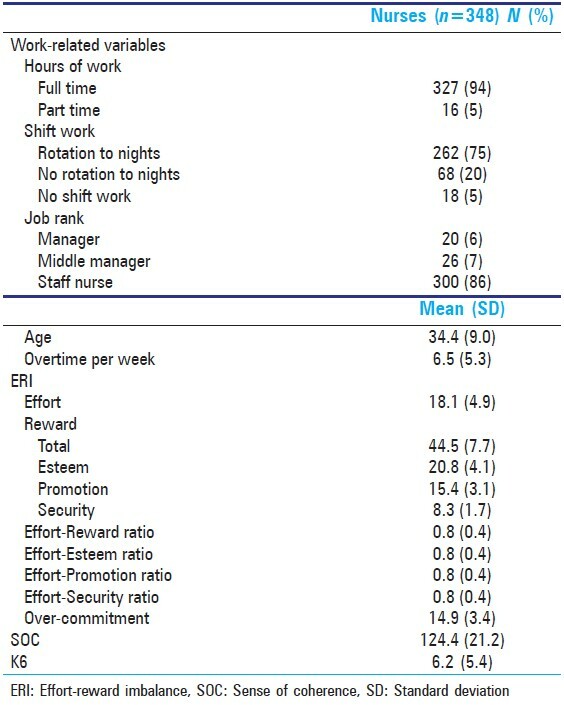 The questionnaire collected data on age, hours of work (full-time or part-time), shift work, overtime hours per week, and job rank (manager, middle manager or staff nurse). The SOC scale consisted of 29 items assessing comprehensibility, manageability, and meaningfulness. Scores for each item ranged from 1 to 7 points, and the total score was calculated as the SOC score. A higher score indicated a stronger SOC. We used Pearson's correlation to investigate the relationship among age, work related-factors, job stress, SOC, and depressive state. To examine factors with a significant effect on depressive state, stepwise multiple regression analyses were conducted with the K6 total score as the dependent variable and variables related to the depressive state as independent variables. We used SPSS 11 (SPSS Inc., Chicago, IL, USA) for all analyses. Significance was defined at the level of 0.05. Completed questionnaires were returned by 420 out of 710 nurses (response rate, 59.2%). Male nurses were excluded from the analysis because only 28 of the 42 (66.7%) male nurses responded. Subjects with missing values for job stress, SOC, or depressive state were also excluded (n = 43). The final sample for analysis consisted of 348 female nurses (52.1%), including nurses who were managers and middle managers. Overtime was reported in hours per week, which was voluntary but limited to 45 h/month. Shift work categories included: "No shift work," "shift work with rotation to night shift," or "shift work without rotation to night shift." Only managers have a choice in shift assignment. [Table 1] shows characteristics of study subjects. [Table 2] shows the Pearson's correlation coefficients between age, overtime hours, ERI ratios, SOC, and the depressive state. Depressive state moderately correlated with three ERI ratios, over-commitment, and SOC. [Table 3] shows the influence of work-related factors, ERI ratios, and SOC on depressive state. SOC, over-commitment, effort-esteem ratio, and age were significantly correlated with depressive state (β = −0.46, P < 0.001; β =0.27, P < 0.001; β =0.16, P < 0.001, β = −0.10, P < 0.01, respectively). The coefficient of multiple determination (R 2 ) was 0.56 (F = 106.56 P < 0.001). We found that SOC, over-commitment, effort-esteem ratio, and age were predictors of depressive state among female nurses in the general hospital. The SOC was inversely associated with depressive state, which was similar to previous studies. ,,, The SOC had a major influence on depressive state [Table 3]. The present findings contribute to the literature investigating the relationship between depressive state, job stress, and SOC. Strength of our study is that we investigated the independent contribution of three ratios of ERI (effort-esteem, effort-job security, and effort-promotion), over-commitment, and SOC to the depressive state. According to our previous study,  effort-promotion and over-commitment predicted a depressive state. The present findings suggest that a depressive state of nurses was associated with not only job stress but also both over-commitment and SOC. 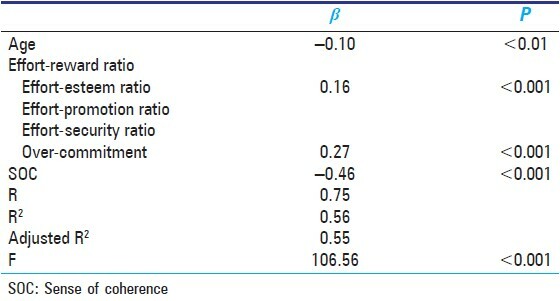 Age correlated positively with SOC [Table 2], which was also similar to a previous study by Harri  who suggested that SOC tends to increase with age. Previous studies suggested that an increasing SOC of workers may reduce negative job stress responses and mental health problems. , Intervention support enhancing the SOC could be effective in preventing nurses from experiencing a depressive state. The present study has some weaknesses. First, the sample size was small and included nurses from only one general hospital. A longitudinal study with a lager sample is necessary. Our findings provide insight into some factors associated with a depressive state among nurses in a general hospital. From a practical perspective, the influence of SOC on a depressive state should be considered for health care professionals. Intervention support such as group cognitive psychotherapy to strengthen comprehensibility, manageability, and meaningfulness may help nurses cope better with job stress and reduce their risk of depression. 2. Agardh EE, Ahlbom A, Andersson T, Efendic S, Grill V, Hallqvist J, et al. Work stress and low sense of coherence is associated with type 2 diabetes in middle-aged Swedish women. Diabetes Care 2003;26:719-24. 3. Jonsson A, Segesten K, Mattsson B. Post-traumatic stress among Swedish ambulance personnel. Emerg Med J 2003;20:79-84. 4. Kristenson M, Kucinskienë Z, Bergdahl B, Calkauskas H, Urmonas V, Orth-Gomér K. Increased psychosocial strain in Lithuanian versus Swedish men: The LiVicordia study. Psychosom Med 1998;60:277-82. 5. Malinauskiene V, Leisyte P, Romualdas M, Kirtiklyte K. Associations between self-rated health and psychosocial conditions, lifestyle factors and health resources among hospital nurses in Lithuania. J Adv Nurs 2011;67:2383-93. 6. Nasermoaddeli A, Sekine M, Hamanishi S, Kagamimori S. Associations between sense of coherence and psychological work characteristics with changes in quality of life in Japanese civil servants: A 1-year follow-up study. Ind Health 2003;41:236-41. 7. Runeson R, Norbäck D. Associations among sick building syndrome, psychosocial factors, and personality traits. Percept Mot Skills 2005;100:747-59. 8. Takeuchi T, Yamazaki Y. Relationship between work-family conflict and a sense of coherence among Japanese registered nurses. Jpn J Nurs Sci 2010;7:158-68. 9. Tuomi K, Seitsamo J, Huuhtanen P. Stress management, aging, and disease. Exp Aging Res 1999;25:353-8. 10. Urakawa K, Yokoyama K. Sense of coherence (SOC) may reduce the effects of occupational stress on mental health status among Japanese factory workers. Ind Health 2009;47:503-8. 11. Buddeberg-Fischer B, Stamm M, Buddeberg C, Klaghofer R. Chronic stress experience in young physicians: Impact of person- and workplace-related factors. Int Arch Occup Environ Health 2010;83:373-9. 12. Haoka T, Sasahara S, Tomotsune Y, Yoshino S, Maeno T, Matsuzaki I. The effect of stress-related factors on mental health status among resident doctors in Japan. Med Educ 2010;44:826-34. 13. Malinauskiene V, Leisyte P, Malinauskas R. Psychosocial job characteristics, social support, and sense of coherence as determinants of mental health among nurses. Medicina (Kaunas) 2009;45:910-7. 14. Ogiñska-Bulik N. The role of personal and social resources in preventing adverse health outcomes in employees of uniformed professions. Int J Occup Med Environ Health 2005;18:233-40. 15. Urakawa K, Yokoyama K, Itoh H. Sense of coherence is associated with reduced psychological responses to job stressors among Japanese factory workers. BMC Res Notes 2012;5:247. 16. Tsutsumi A, Ishitake T, Peter R, Siegrist J, Matoba T. The Japanese version of the effort-reward imbalance questionnaire: A study in dental technicians. Work Stress 2001;15:86-96. 17. Tsustumi A, Kayaba K, Nagami M, Miki A, Kawano Y, Ohya Y, et al. The effort-reward imbalance model: Experience in Japanese working population. J Occup Health 2002;44:398-407. 18. Furukawa TA, Kawakami N, Saitoh M, Ono Y, Nakane Y, Nakamura Y, et al. The performance of the Japanese version of the K6 and K10 in the World Mental Health Survey Japan. Int J Methods Psychiatr Res 2008;17:152-8. 19. Sakurai K, Nishi A, Kondo K, Yanagida K, Kawakami N. Screening performance of K6/K10 and other screening instruments for mood and anxiety disorders in Japan. Psychiatry Clin Neurosci 2011;65:434-41. 20. Kikuchi Y, Nakaya M, Ikeda M, Narita K, Takeda M, Nishi M. Effort-reward imbalance and depressive state in nurses. Occup Med (Lond) 2010;60:231-3. 21. Harri M. The sense of coherence among nurse educators in Finland. Nurse Educ Today 1998;18:202-12.